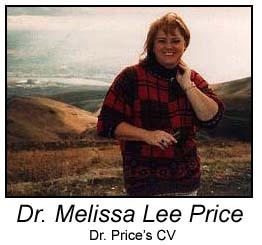 Interactive Mystery Productions showcases instructional interactive multimedia work created by Dr. Melissa Lee Price for use in her classes, as well as available to the World Wide Web Community. Dr. Price is Professor of New Media at Staffordshire University in Stoke on Trent, England, where she heads the MA programs in Interactive Multimedia and European Interactive Multimedia, and supervises multimedia doctoral students. Her research interests focus on the use of multimedia in the teaching and learning process, especially in collaborative work experiences in a virtual environment. Dr. Price began online teaching in 1995, with a doctoral seminar on the uses of technology in teaching and learning to students in the United States and Canada from Northwestern State University of Louisiana. She has won numerous awards for educational multimedia, including in 1997 becoming the first person honored for online instruction by the Broadcast Education Association (BEA). She has subsequently gained five more BEA awards and in 2003,was elected a Fellow of the European Academy of Digital Media; in 2005 she was elected a Fellow of the Royal Society for the encouragement of Arts, Manufactures & Commerce (RSA). Dr. Price's students have also received international aclaim, receiving over 100 awards including Europrix, Pirelli, BEA, Association for Educational Communications Technology, and Siggraph. Interactive Mystery Productions houses material designed to encourage young multimedia producers to concentrate on content and users before focusing on technology. Dr. Price's approach to teaching is that she's more of a coach than a lecturer. She encourages students, young or old, to stretch, reaching a higher goal than they would normally set for themselves. Dr. Price believes that learning is free and therefore makes free access to her teaching material. She does ask that if you use her material that you respect her authorship.